Hello ladies! Just when I thought things couldn't get any better before October ends, in comes BDJ Box.. 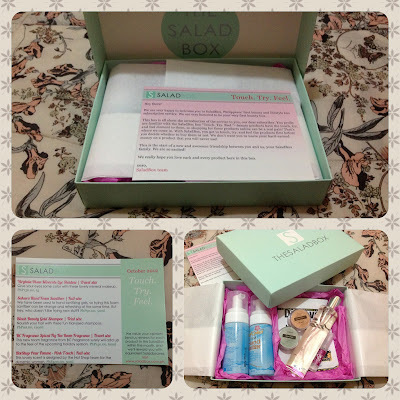 This is my second take on sample product subscription, Saladbox being my first so I thought I wouldn't be as excited as I was the first time but I was wrong. When I was told that my BDJ Box arrived yesterday, I couldn't wait to go home and finally see what goodies were included. Don't you just love how it looks? I also like the way they decorated and arranged the products to properly fit the BDJ Box. 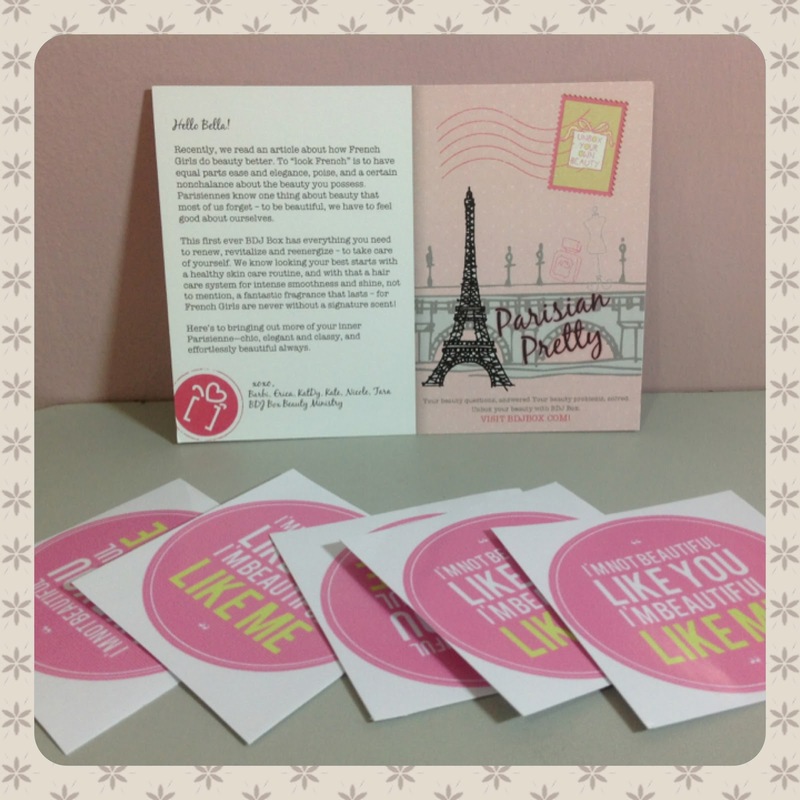 Inside is a welcome note from the BDJ Box Beauty Ministry and a set of stickers saying "I'm not beautiful like you, I'm beautiful like me". BDJ suggests you to 1) stick it on an object you see everyday to serve as a reminder, 2) give it to someone you think is beautiful, 3) give it to someone who can pass it on, 4) stick it on an area where a stranger can see it, 5) get creative and figure out the best way to pass on this message. 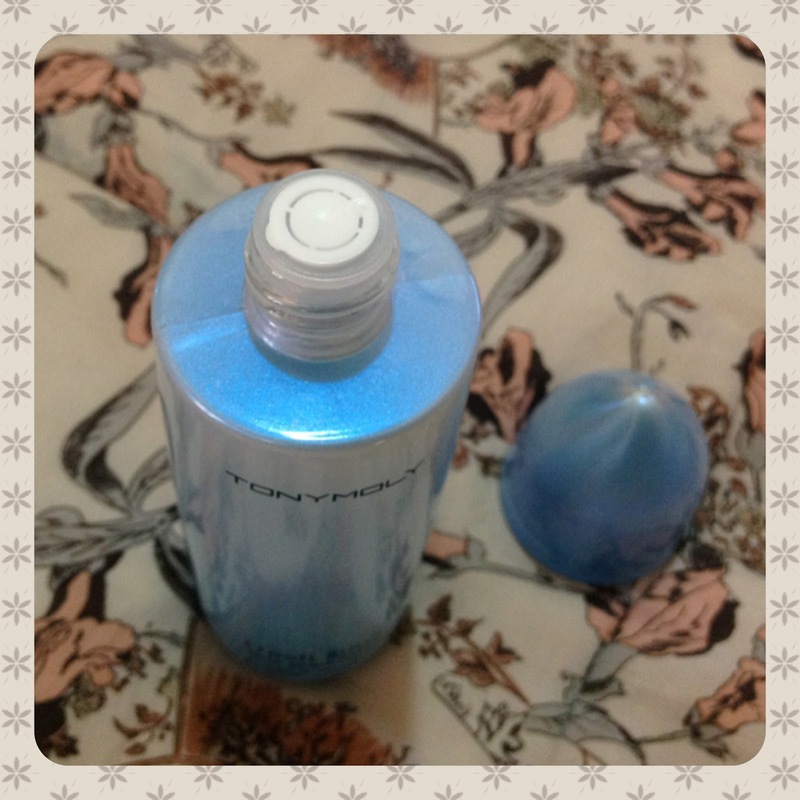 The perfect tandem designed to fight dandruff from the first application. Eliminates all traces of makeup and impurities, leaving skin smooth and radiant. Fights the 5 signs of damaged hair and makes hair stronger, smoother and shinier. Stimulates your skin's natural lifters and revives your skin's firmness and elasticity. Moisturizes, whitens and evens out your skin tone as you protect it from the sun. Clears skin imperfections and prevents dirt from further building up. I am absolutely happy about my first BDJ Box not only because it's generously stuffed but more so because it included products I use everyday and products I've been aching to try. 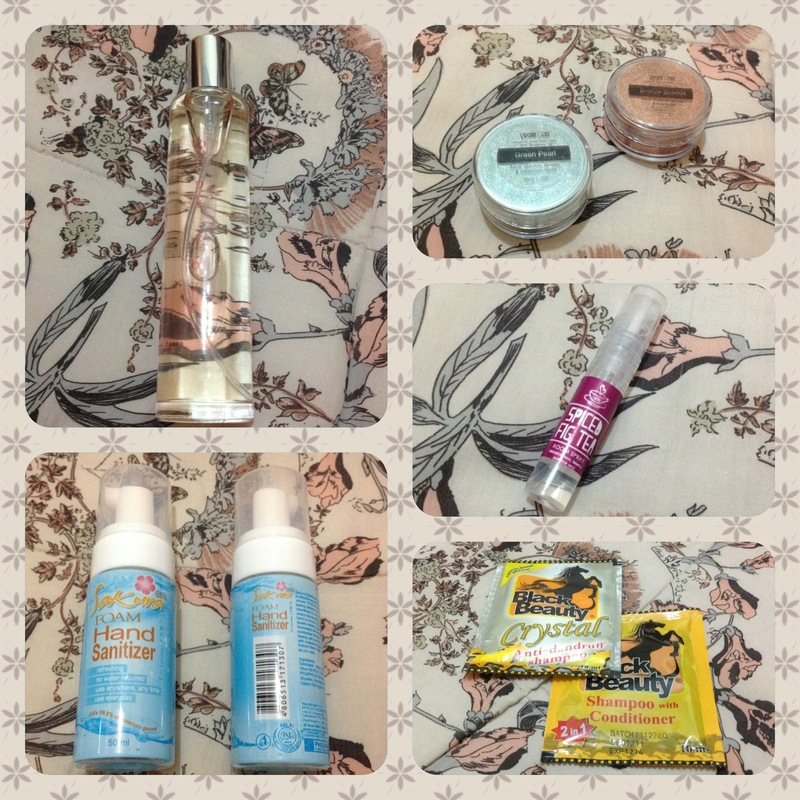 It also has items I don't usually buy but willing to try and repurchase if they turn out great. Seeing the contents made me feel like the box was personally intended for me, like it has JING written all over it. The BDJ box reflects how much hard work and dedication were devoted by the team who made it. Kudos to the BDJ Box Beauty Ministry and I look forward to receiving the next box in the following months. 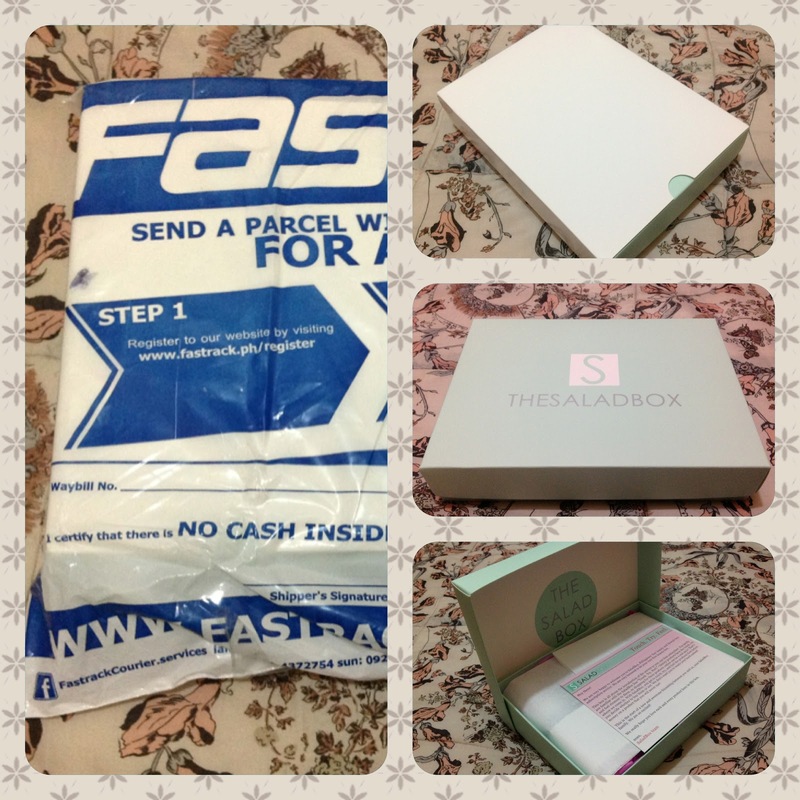 My very first Saladbox has finally arrived and I was so excited to personally receive it from the messenger yesterday. You may think that there's nothing too special about the packaging but for me this box became the source of my good mood the entire day. I almost took it with me so I could open it on my way to work. Good thing my emotional quotient wasn't as low so I just opened it when I got home last night. 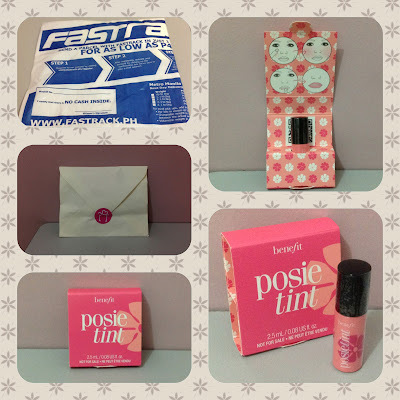 Inside is a card that has a list of all the product samples included in the October Saladbox with a short description and retail price of each item. First thing I noticed was the lack of protective stuffers often used when shipping fragile items but it really didn't bother me too much. 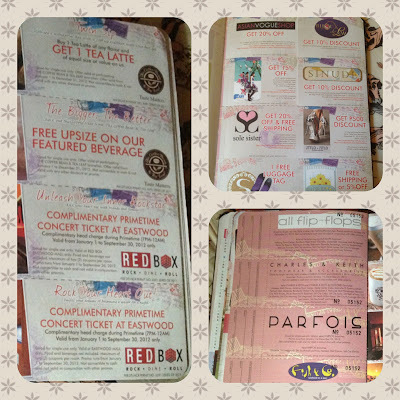 I like the way they took time to arrange the samples in a girly fashion using white and pink colored paper. This new room fragrance from BC Fragrance surely will add up to the feel of the upcoming holiday season. Nourish your hair with these fun trial sized shampoos. We have been used to hand sanitizing gels, so trying this foam sanitizer can be strange and refreshing at the same time. But hey, who doesn't like trying new stuff? This lovely scent is designed by the Hot Shop team for the dynamic woman. This is not actually a review of the items included in the Saladbox. I just want to tell you what I think of subscribing to sample products now that I got to try it. You're getting more than what you paid for because some of the items come in full-size. 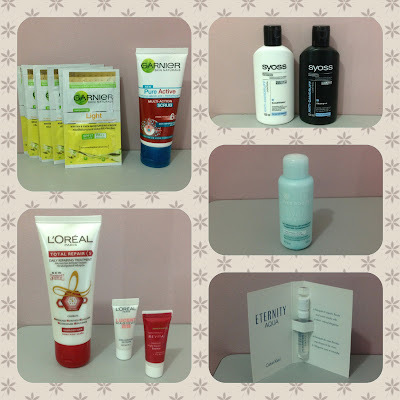 You get to try out products and discover new favorites that you never thought of buying in the first place. This is very much true with the Sakura hand foam sanitizer which I now consider a great find. Products are conveniently delivered to your doorstep. Most of the products are in travel friendly sizes so you can bring them with you everyday or when you go out of town. You might not like all the items included in the box. In my case, the Hot Shoppe pour femme in pink touch is not my type of scent. You may be getting more than what you paid for but in reality, you won't be buying most of these items or spend money on them so you're not totally saving. If you're the type who loves to try new products but don't have enough time and energy to go through countless product displays at the mall, this might be the best time to subscribe to Saladbox. 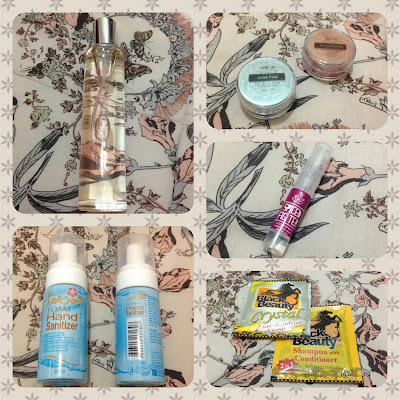 If you love trying new stuff but still want to have control over what products to try and not be surprised with items that will just end up unused or given away, then this might not be your thing. Though it wouldn't hurt to subscribe and try it for yourself first because you can always unsubscribe if you feel like it. 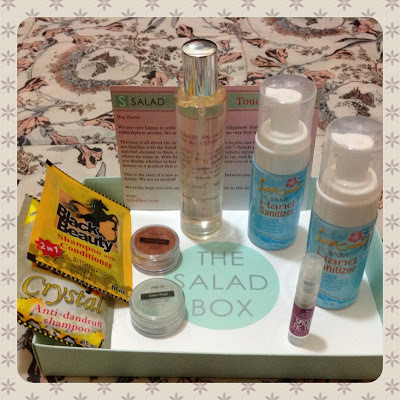 Overall, I am very happy with my October Saladbox. 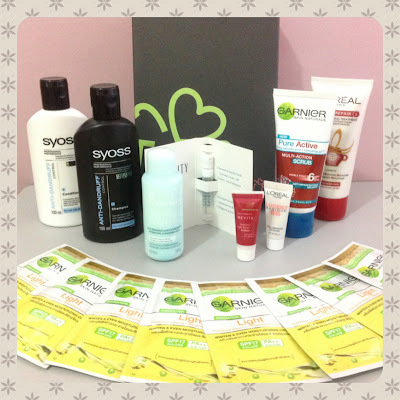 It's actually a dream come true that we have a local version of product sample subscription. Now I can't wait for my next box in November and I'm more ecstatic about the December Saladbox. I'm thinking, they might pitch in some more extras in the spirit of the holidays so I'm keeping my fingers crossed. 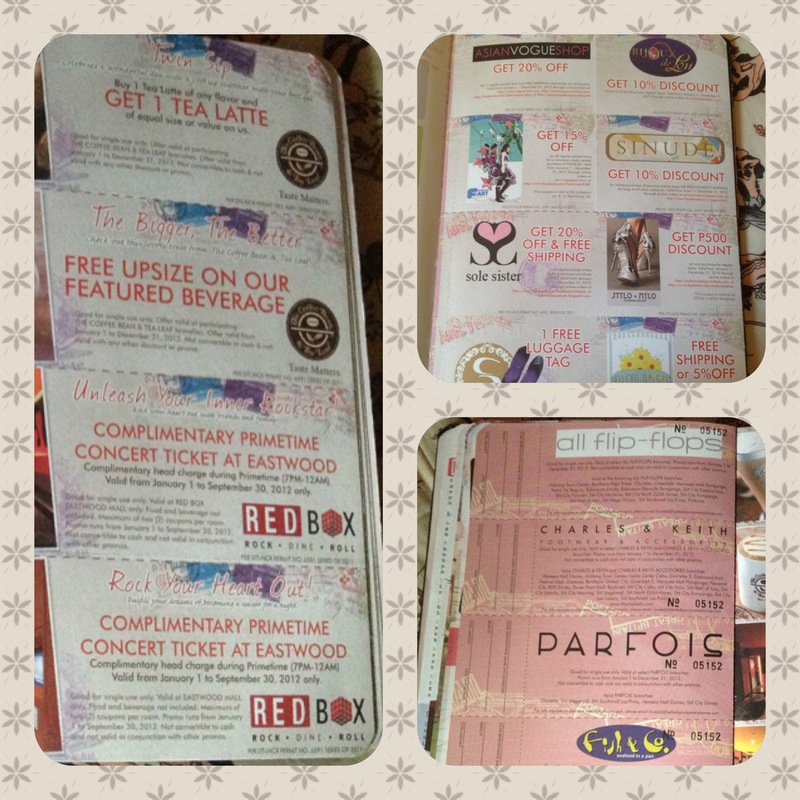 Christmas is just around the corner and a lot of establishments are going on an early sale. I know it's a little early to buy gifts for your friends and loved ones but discounts of up to 50% off can really be tempting especially when it's from a trusted brand like Tony Moly. My friends and I grabbed this opportunity and got ourselves the Tony Moly Fresh Aqua Tear Drop Toner from its regular price of Php 898 down to Php 449. I actually got to try this product in its sample size a few months ago. 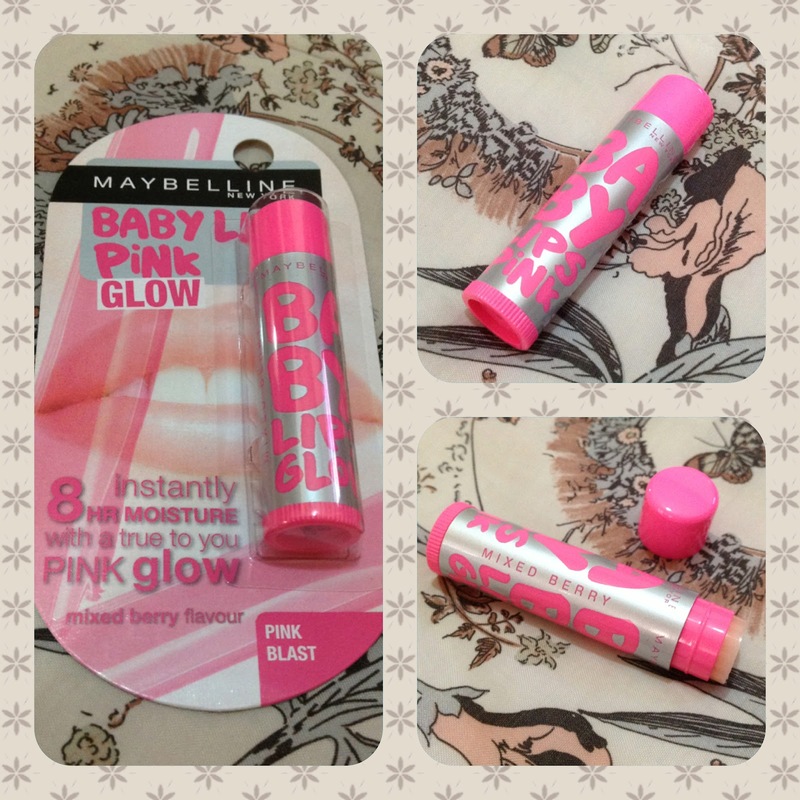 I instantly fell for this product the first time I used it and promised myself to buy one in the future. The full size comes in a 140 ml bottle with a tear drop shaped cap. 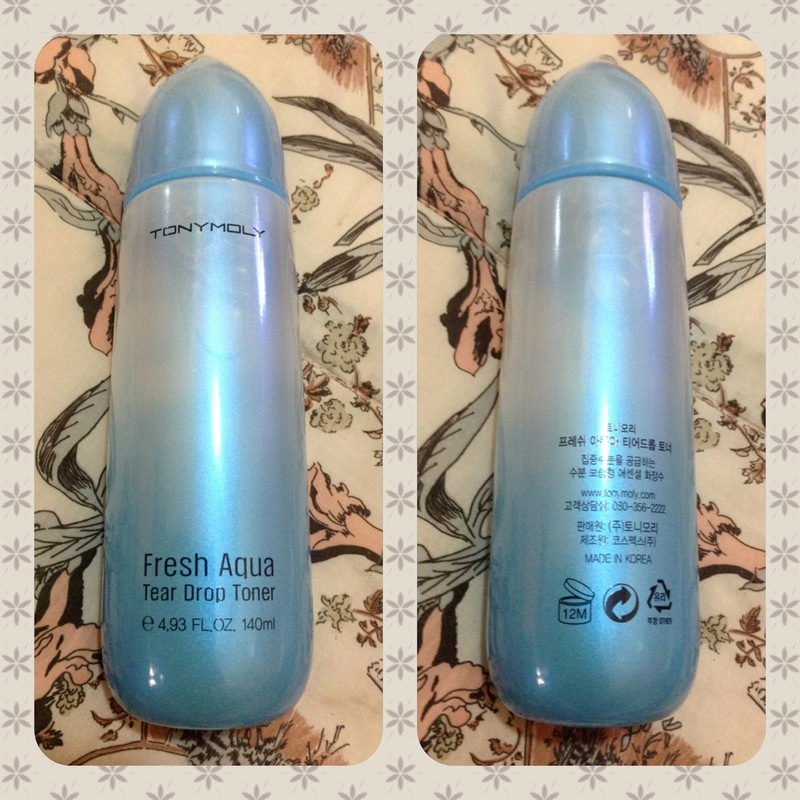 I love that Tony Moly products are sealed to ensure quality and freshness. This is a clear toner that gives off a refreshing scent leaving you with a clean and cool feeling. 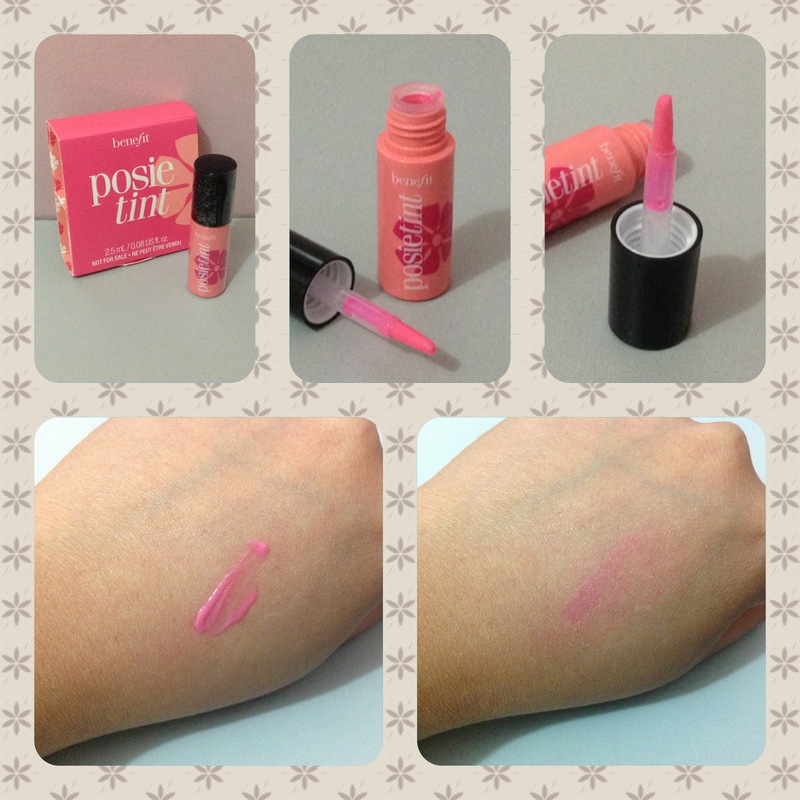 It feels so smooth and hydrating on your skin that it gives your face a well moisturized and non greasy finish. You can top this with another moisturizer or if you're in a hurry you may skip the moisturizer and top it with a primer. Though I'd love to share what the box says, everything is in Korean so you just have to believe me when I say that this toner is hydrating that it wouldn't hurt to skip your moisturizer. If you have oily skin I think this can still fit in your skin care routine because it doesn't have a greasy finish. It's like washing your face with fresh water. 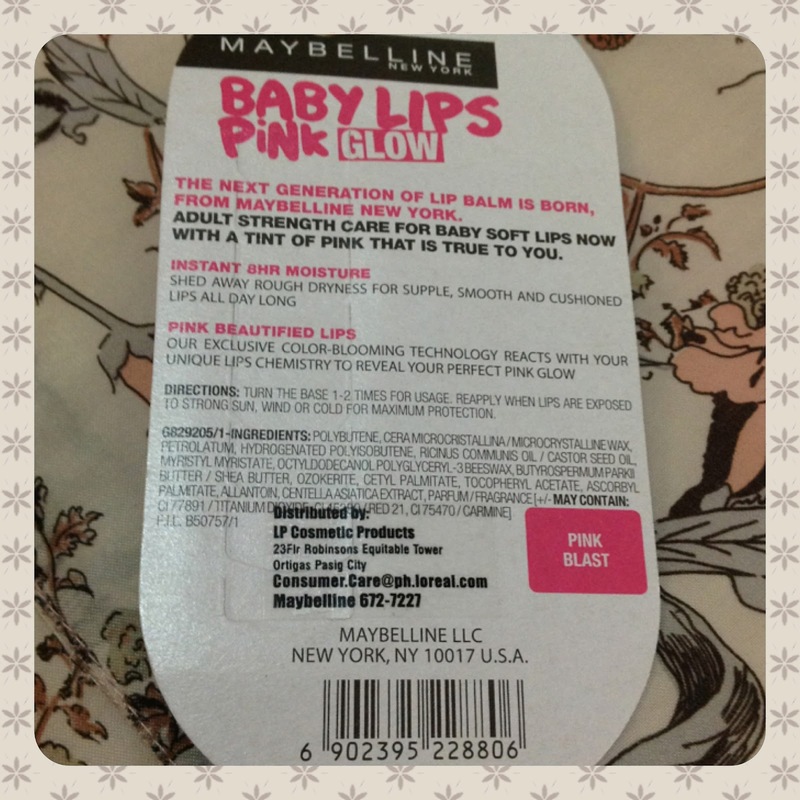 I love this product and I am willing to splurge and repurchase it in regular price. I recommend this to all of you who wants a hydrating toner that can double as a moisturizer. If you're tight on budget, you may want to check out Tony Moly SM North because they're still on sale until supplies last this October. Hello friends, I love days when I finally get to try a product I've been itching to buy for the longest time and find out it really works. Though it also crosses my mind that I should've listened to my instincts earlier, the good feeling of a eureka moment still prevails all because of Garnier. 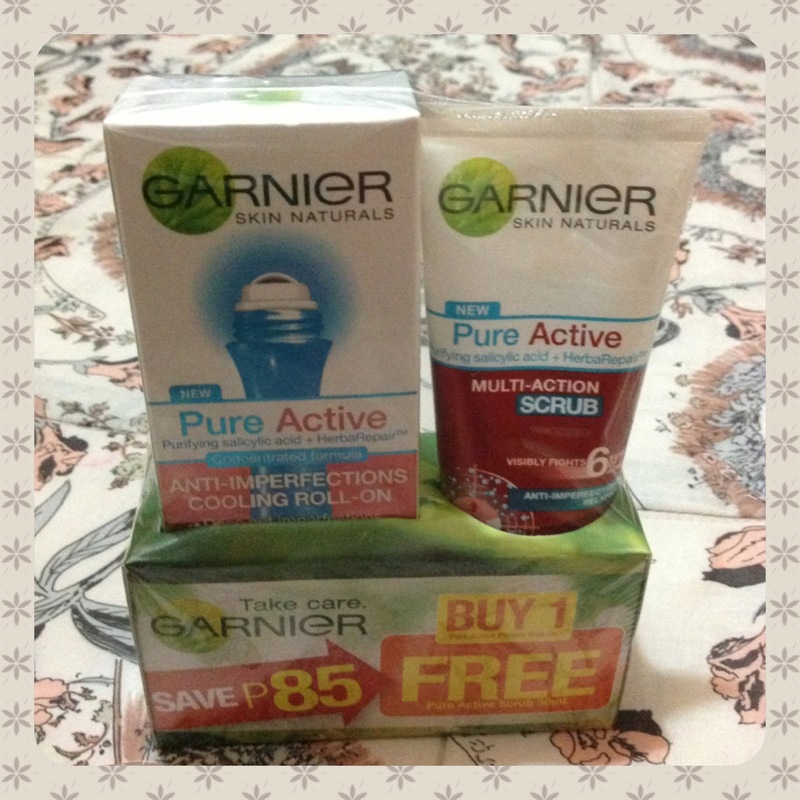 I love Garnier products but when their pure active line was launched early this year I wasn't too eager to try it. I thought it's just another self proclaimed effective pimple fighter backed by a popular celebrity in the person of Miss Georgina Wilson who has gorgeous skin to begin with. Good thing I came to my senses and finally tried it after several months of contemplating. 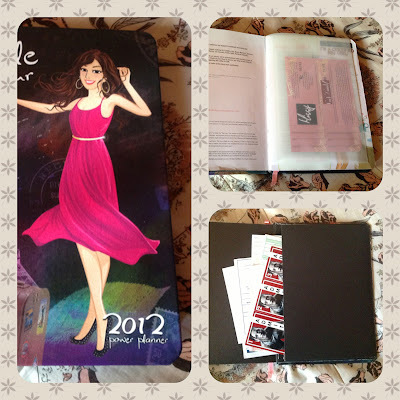 I bought this at Landmark Trinoma a few days ago and it came with a free Garnier pure active multi-action scrub. Now that's a great buy don't you think? The Garnier pure active anti-imperfections cooling roll-on comes in a 15 ml tube which is quite reasonable for its tag. 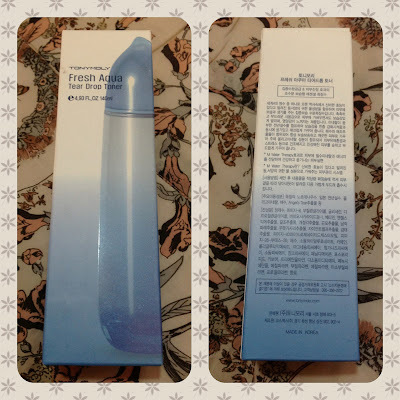 It has a metallic roller that dispenses just the right amount of product and doesn't leak when not in use. It has a cooling effect and doesn't sting even when applied on an active pimple. What really got me into thinking that this product works is when I used it on an emerging pimple a few days ago, it didn't go full blown. I also noticed that it dried up faster than usual and didn't darken as much. The product has a musculine scent though it really doesn't bother me, it may not be too pleasant for others. Also, you may experience minimal peeling on your dried pimples. 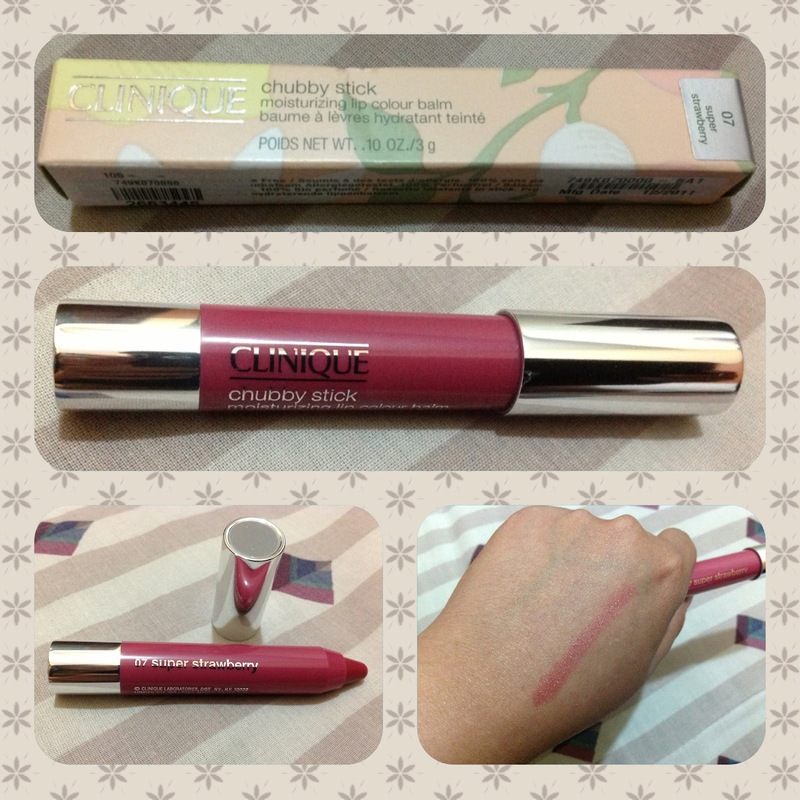 I love how this product worked for me even after just a few days of use on an emerging pimple. 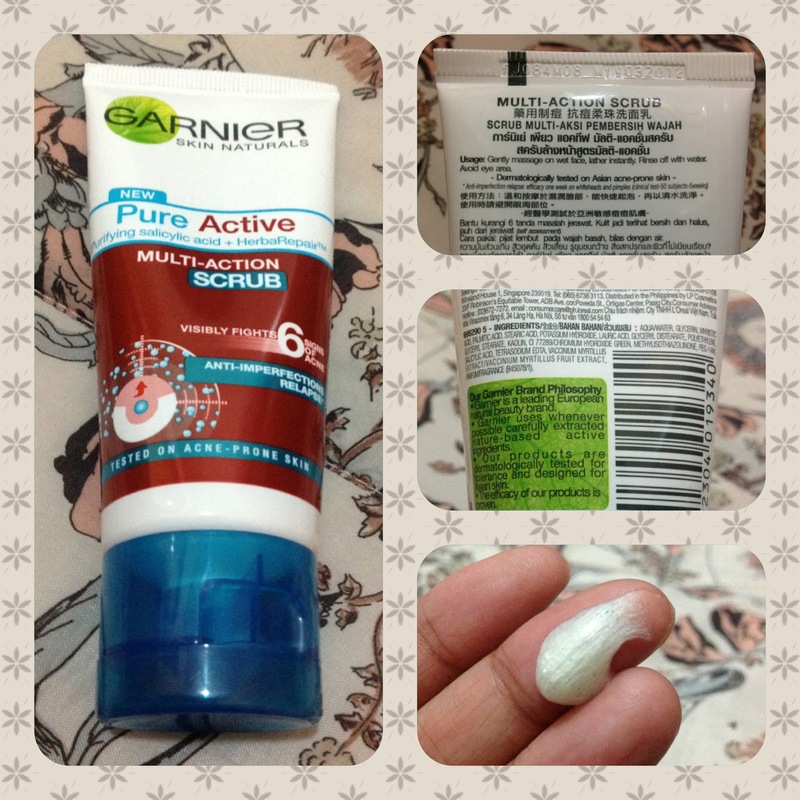 Though I haven't used this on a cystic or full blown pimple, I'm hopeful I won't get to have them especially now that I have Garnier pure active anti-imperfections roll-on. I recommend this to those of you who are willing to try out a new and effective product. The Garnier pure active multi-action scrub that came with the purchase is in a 50 ml squeeze out tube. I love that this facial scrub doesn't scream of sandy beads. 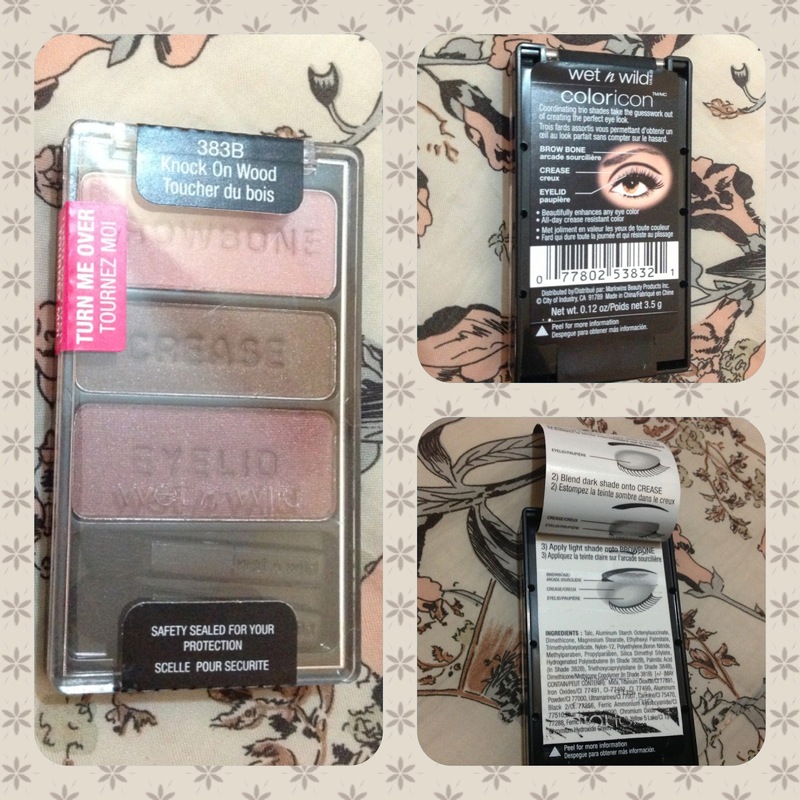 It has a creamy texture with just the right amount of micro beads that don't hurt your face so you can use it daily. It does smell like the pure active anti-imperfections roll-on but more subtle and almost unnoticeable. I've been using this everyday since I bought it and though I have been breaking out in the past days, I noticed my pimple scars lightening quite faster and emerging pimples didn't quite progress. This has a little bit of a drying effect on your skin so you really need to moisturize after using it. I am totally into this product that I am repurchasing it and recommending it to all of you who are still on the look out for a pimple treatment regimen that works and doesn't cost much. Who knows, this just might work well for you like it does for me. If you're a fan of Tony Moly, this whole month of October is the best time to update stocks of your favorite TM products. If you haven't tried this Korean brand and you're tight on budget, now is the perfect time to start because their SM North Edsa branch is on sale. Get to experience Korean skin care at its finest with as much as 50% off on premium products including Dandy Guy, Fresh Aqua, TM Sports, Premium Zen, Caviar Essential, Cottony Essence and more! 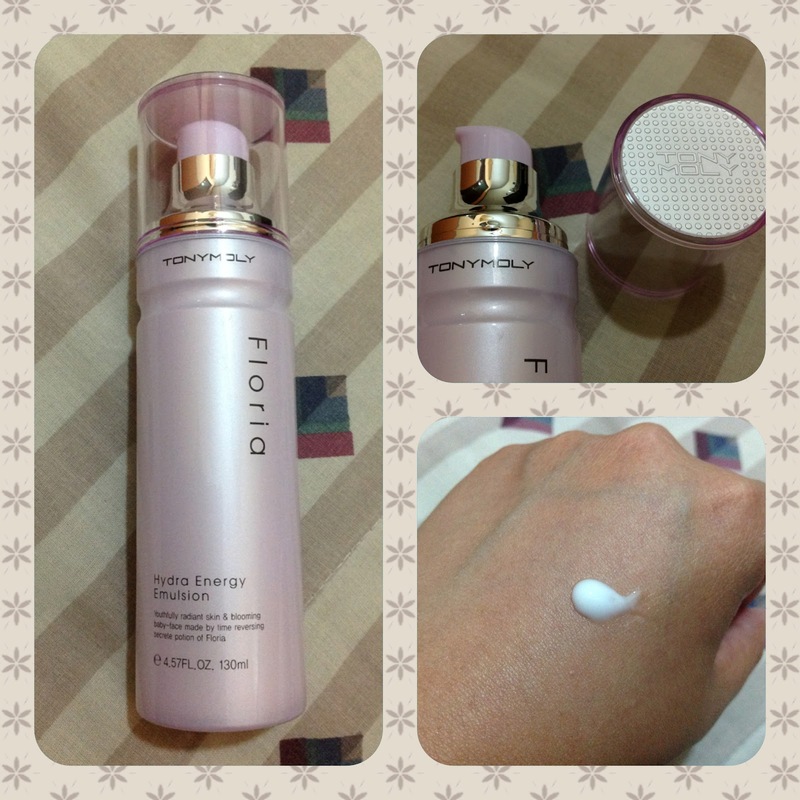 My friends and I already grabbed this rare opportunity and bought ourselves the Floria moisture energy skin emulsion. Tony Moly says that the Floria moisture energy skin emulsion gives you youthfully radiant skin and blooming baby face. That's quite a heavy promise to fulfill. It's mostly made of natural flower extracts and is paraben free hence has no carcinogenic properties. I love the generous 130 ml bottle topped with a pump dispenser which reminds me so much of the beauty products I see in Korean telenovelas (specifically the series "49 Days") . It has an opaque white color and has the consistency of a light lotion that spreads easily and melts in your skin after application. 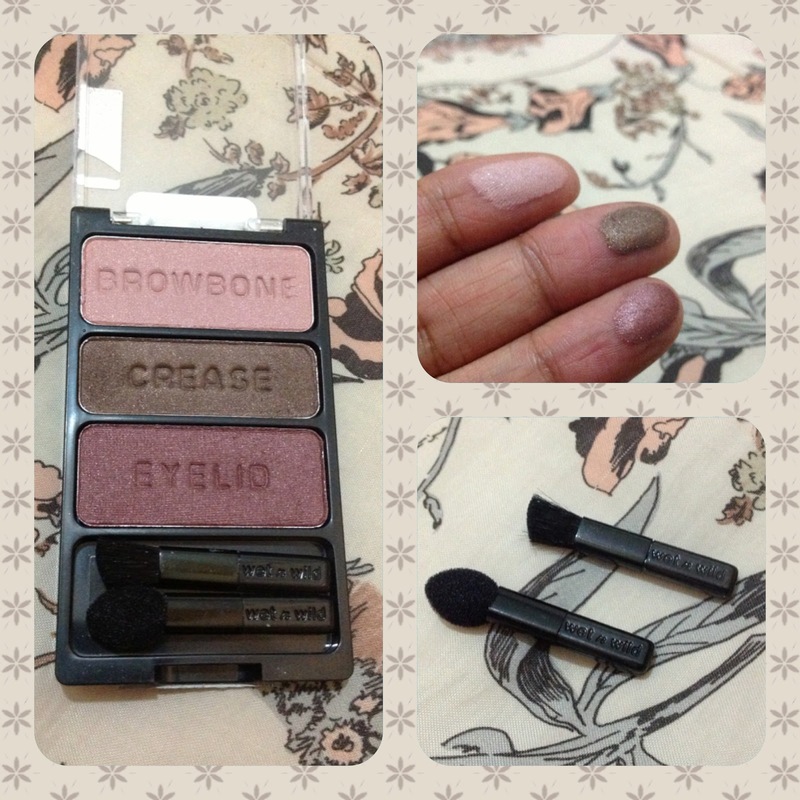 It has a bit of a sticky finish but goes off in a while leaving your skin supple and smooth to touch. I'm not so crazy about the scent which reminds me of fresh roses, good thing it's not too strong and it instantly fades after a few minutes. The one thing that I don't like is the lack of SPF and its regular price tag. I think it's quite expensive for a moisturizer that doesn't even offer sun protection. 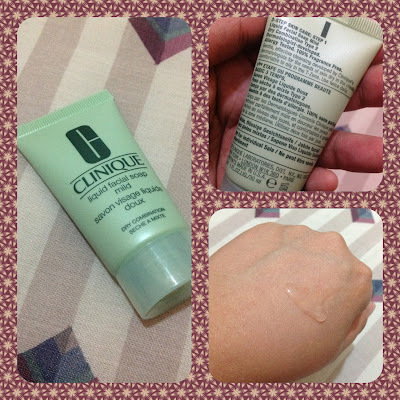 After a week of using this product I haven't seen any dramatic changes but it does have a moisturizing effect on my skin. Though I noticed a pimple about to break out on my chin since I started using this, I can't really conclude that this product is totally responsible. 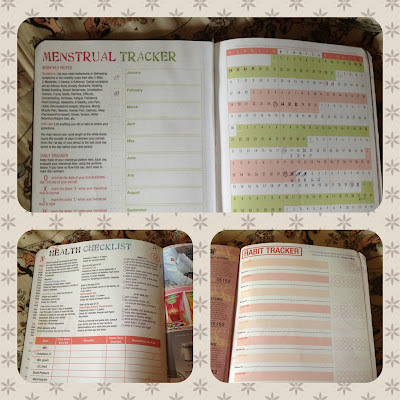 It may be because of hormonal changes since I'm nearing my period. 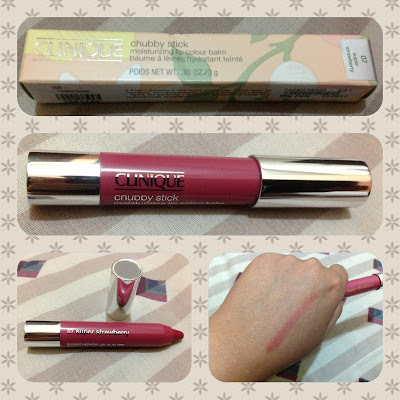 I love Tony Moly products but I honestly have to say that I won't be repurchasing this. Instead, I plan to buy their other moisturizers so I could choose which line best suits my skin type. Will I repurchase it at 50% off? Hmmm.. I might reconsider but I need to give this product more time to prove itself worthy of my undying support and recommendation. After almost 2 weeks of use, I have to admit that Tony Moly has done another great job of manufacturing their Floria line. The Floria hydra energy emulsion impressed me so much that I had to go to 2 separate Tony Moly branches just to buy the Floria youth energy cream. Now, I stand guilty of judging a product after just a week of use. I will definitely buy this even in its regular tag and I highly recommend it to those of you who want a product that can give you your desired results in due time. 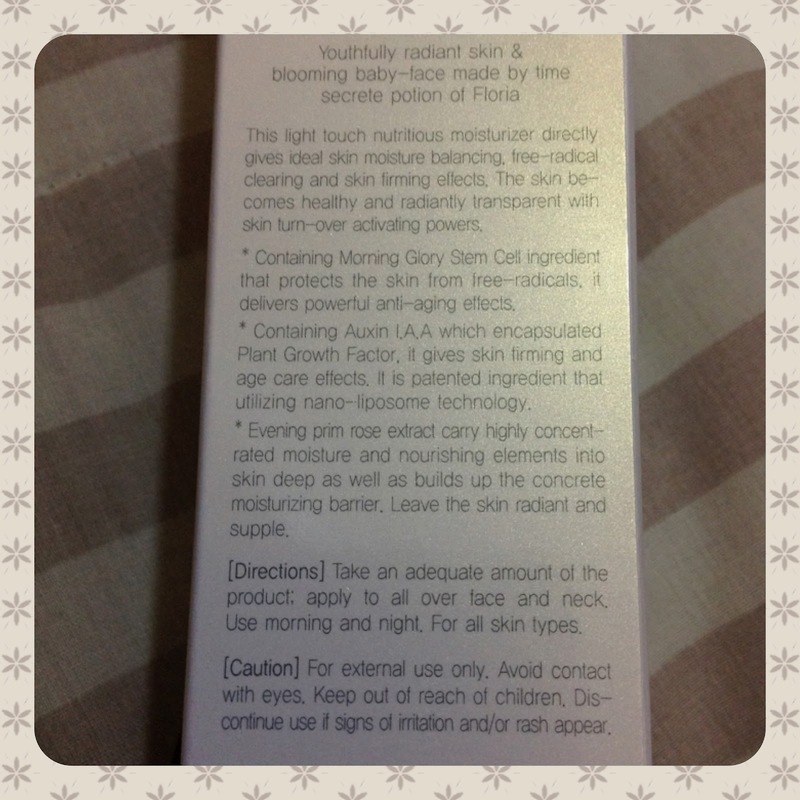 I've always been a follower of YSA skincare products especially their medicated toners. In the past years, I haven't tried any regimen as effective as what I've experienced with YSA until I tried the Clinique 3-Step Skin Care System. I've heard about the 3-Step System in the past years but never really considered trying it because I already have a skin care routine that works. But recently, I've been thinking of future possibilities and decided I should find a back-up regimen and luckily I did with Clinique. It's literally what the doctor ordered. Clinically formulated by leading dermatologists based on their day-to-day experience with patients. Simple. Logical. Custom-fit to your skin's needs. 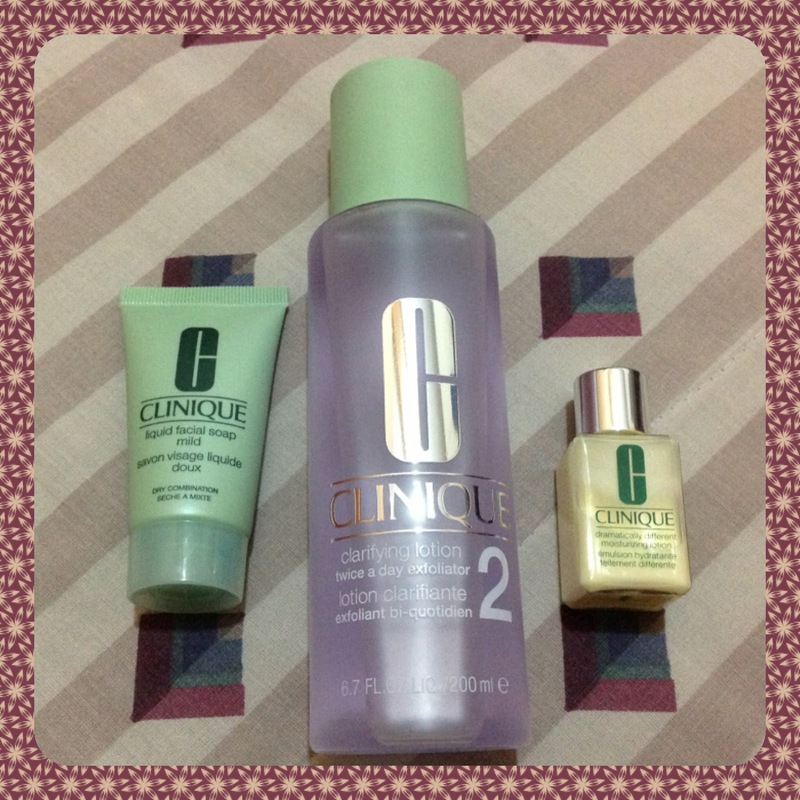 I was able to assemble my personalized system with the help of Clinique's sales assistant during my recent visit at their Trinoma counter. 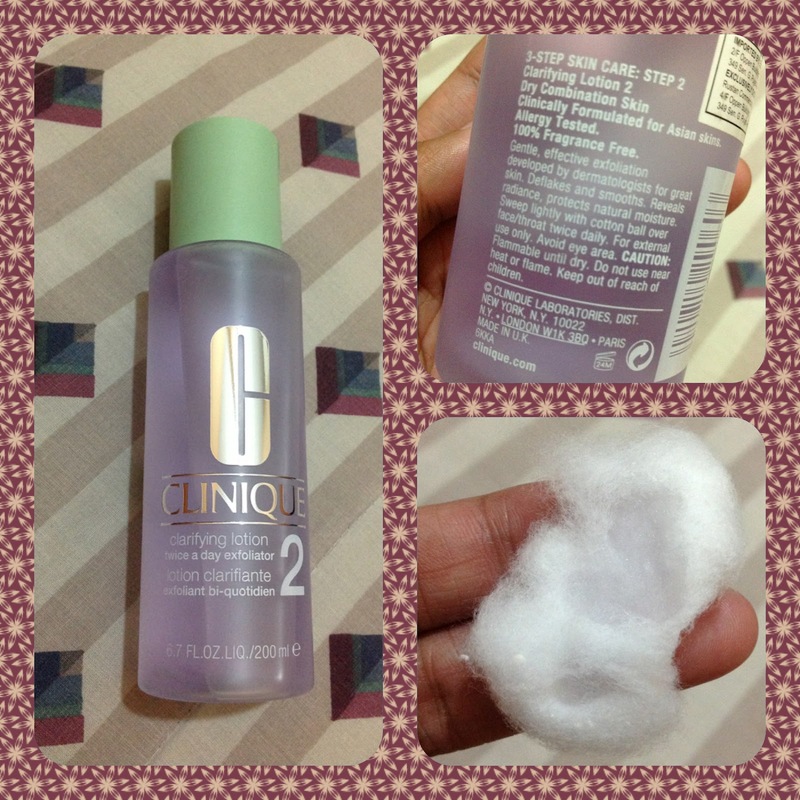 She helped me determine my skin type, dry combination, oily on the T-zone and dry on other areas. Since the bonus time included a liquid facial wash and moisturizing lotion, all I had to purchase was the clarifying lotion. 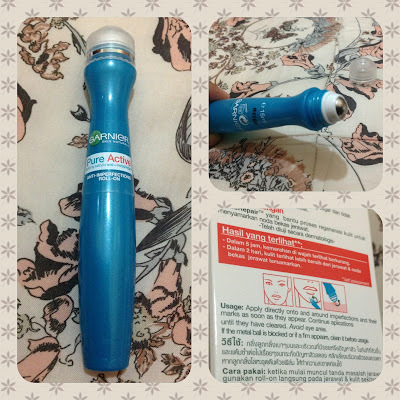 The liquid cleanser's sample is in a squeeze out tube with a twist off cap but the full size is in a bottle with a pump. It's clear and has a slightly thick consistency. It spreads easily and lathers moderately, just enough to rid your face of accumulated dirt. It cleanses effectively without drying your skin leaving it feeling moisturized and supple. 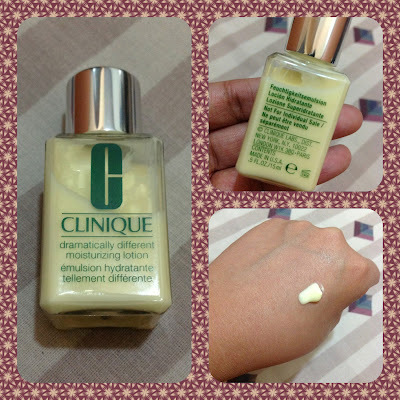 Clinique's clarifying lotion #2 is for dry combination skin like mine. It's in a glazed plastic bottle with a spill proof cap. 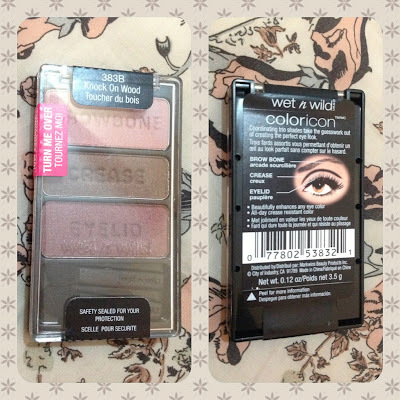 It gives a hint of lilac color when in the bottle but looks clear on a cotton pad. The scent doesn't really bother me, but it's quite strong when applied. It doesn't sting or dry your skin. I noticed my skin improving in just a few days of use. My pimple marks seem to lighten faster than usual and I haven't had any pimple break outs. 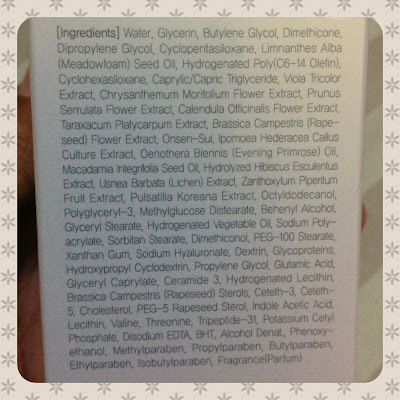 This moisturizer is in a small bottle with a twist off cap but the full size has a pump dispenser. It has a smooth texture with the consistency of a lotion that spreads smoothly with ease on your face. It has a mild almost unnoticeable scent. 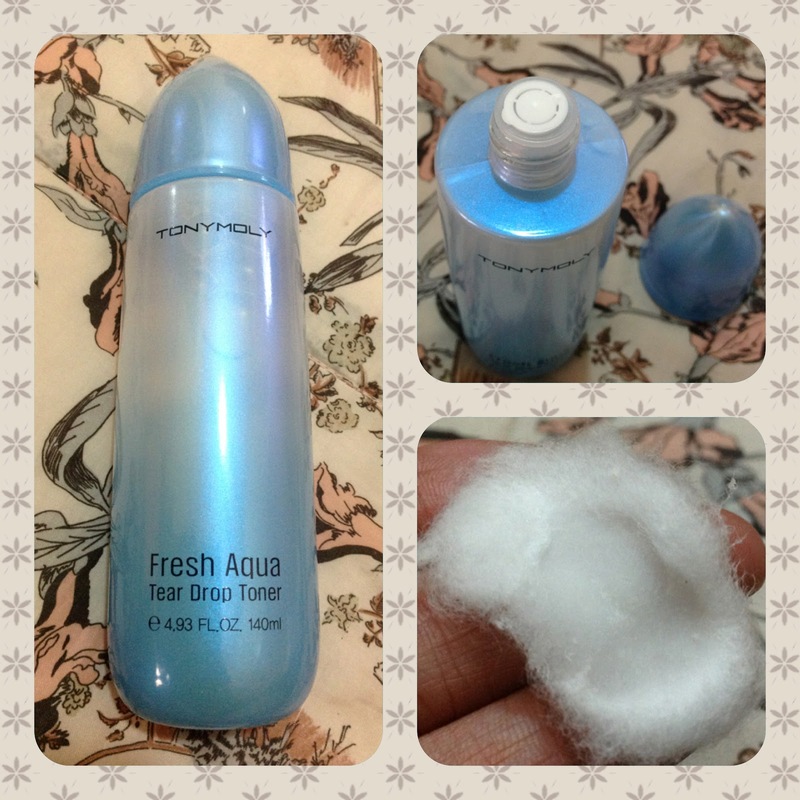 It instantly hydrates with a slight sticky feel that goes off after a while. I do recommend this at night and it may take time before you can layer this with makeup primer at day time. I love that I've been waking up to a clear, supple skin every morning since I started with Clinique's 3-Step Skin Care System. I am getting more than what I expected from these simple steps. I will definitely continue this and will repurchase the full size once I run out of the sample sizes. By far, this is the best high end purchase I've made since I started consciously caring for my skin. 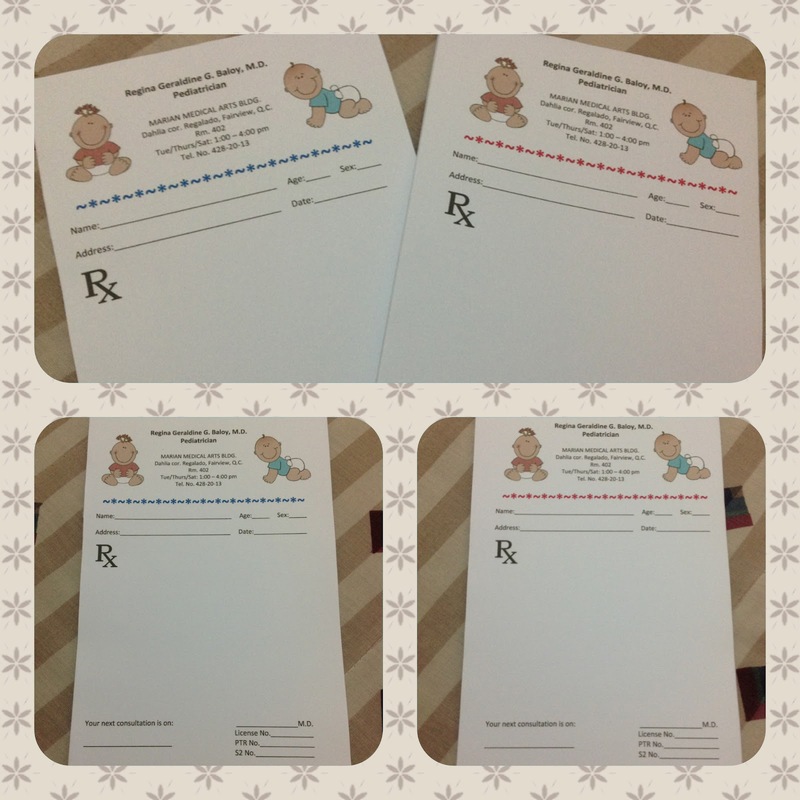 I do recommend it to everyone who wants to see visible results in just a few days. 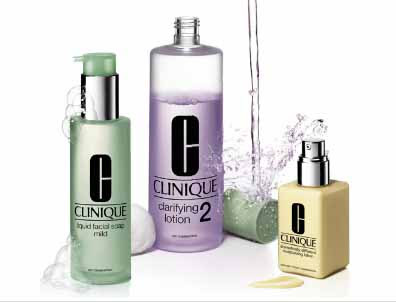 If you've been out there still trying to find a skin care routine that works, why not try Clinique's? Who knows you might just save more than what you think compared to buying more affordable products that don't deliver the same results.